A yellow-red field,quartered per saltire into four traingular sections (red-yellow-red-yellow). In its centre, the Coat of Arms of Aragua State. The CoA is divided in three "quarters": the main one, in gules, occupies, on the top, a space equal to the other two "quarters" together (again, it is divided diagonally); the second "quarter" in gold and the third "quarter" in azur. The main quarter sports the figure of a winged woman carrying a lauril crown in her right hand and palm leaves in her left hand; symbolising victory. The second quarter we have the Samán of Güere, a tree of historical significance, as an emblem of the endless fertility of the araguenian soil. we can see, on the third quarter, a the historical house of the Bólivar Sugar cane Farm, bursting in flames as it did in 1814 (San Mateo Battle), when, serving as headqarters and armory for the Independentist army, was blown up heroically by General Ricaurte, who set fire to the Gun Powder deposits before they were captured by royalist troops . Heading the CoA, a rising sun where the word "ARAGUA" can be read. A Coffee branch and a Sugar Cane branch circle the CoA, which sports a yellow band on its bottom, where "February 1814" and "March 1814" can be read, remembering the glorious battles of La Victoria (12 Febuary 1814) and San Mateo (20 March 1814). 1) In October 20 of 1992, the state Legislative Assembly proclaimed the Law of Flag of the Aragua State. The qualifier panel of judges selected the design of Inés María Valverde Pérez. The colours are the same of the flag of Spain, which have been traditionally the colours of Aragua. Here is an image. 2) The coat of arms exists since the decade of the eighties of the XIX century, as seal of the state. It was decree as coat of arms in 1905 and ratified in 1926. It is divided in three quarters: the first, in red field, ocupies in the superior part a space as much as the double of the other two, from which is separated by an oblique line that goes from up below and left to right; the second, in field of gold, located toward the left, forms an obtuse angle with the vertex to the right; and the third, in field of blue, occupies the inferior part in form of sharp angle with the vertex toward the superior part. In the first quarter there is a woman's figure carrying a wreath of laurel in the right hand and a palm in the left hand, in order to symbolize the victory. In the second quarter appears the "samán" of Guere (Pitecellobium saman Jacq. Benth, emblem tree of the state, admired by Humboldt and Bonpland, whom in 1800 calculated that it was about 1.000 years old; Guere is a site near Maracay, the state capital), like symbol of the inexhaustible fertility of the "Aragüeña" land. In the third quarter appears the arsenal house of the Ingenio (Sugar Mill) Bolívar, which belonged to the Liberator, covered of flames, in order to commemorate the heroism of Antonio Ricaurte (New Grenadian-Columbian colonel who sacrificed himself exploding the arsenal of the patriot army in order to avoid its capture by the enemy) during the second battle of San Mateo, 25 March 1814. Adorning the superior part of the coat, there is a nascent Sun, in whose disk appears the name of the state: Aragua. (I am not sure, but it seems that in 1992 it was decided that each ray of the Sun should represent a municipality; if so, the coat inserted in the flag that I am sending should have 18 rays, and not 15). The coat is fringed by a branch of coffee and another of cane of sugar, tied below with a ribbon in gold with this dates: Febrero de 1814 (February of 1814), in the left part (in order to commemorate the second battle of La Victoria, important victory of a group of soldiers and students, leaded by General José Félix Ribas, over royalist forces, 12 Febuary 1814) and Marzo de 1814 (March of 1814), in the right part (in order to commemorate the battle of San Mateo previous cited). 3) The Anthem of the Aragua State was decree in 1906, modified in 1909 and ratified in 1926. The modification consisted in suppressing the two last verses, because they were considered laudatory towards the overthrown (1908) former president Cipriano Castro, who achieved an important military victory, in 1902, in La Victoria, against a revolutionary army that almost duplicated his forces. Cipriano Castro was native of the Andean state of Táchira. Lyrics was wrotten by the poet Ramón Bastida and the music was composed by Manuel Betancourt. Music is almost like a subtle variation of The Marseillais, the French national anthem. 4) As a curious note, I would like to add that the city of La Victoria , second in importance and former capital of the state, don't owe its name to these battles, that there were two during the war of Independence, one in 1879 and another, the last one, in 1902, but to its Lady patron: Nuestra Señora de Guadalupe de La Victoria. The Flag - Attributes and Semiology: Consist in a field divides per saltire, which generate four triangular sections: the upper and lower are red, whilst the flanques are yellow. The Araguenian Coat of Arms is emplaced on its center in all its heraldic attributes. The yellow symbolizes the tropical sun, which characterizes the state and equally the Nobility and the Charity, virtues that are part of the personality of its native ones. The red symbolizes the Strength, the Value, the Fidelity, the Happiness and the Honor that purify the Araguenian identity and remembers equally, the heroes which arose in Aragua and that spilled their blood on its floor and on the rest of the national territory, in favor of the Independence of Venezuela. Historical Synthesis: Aragua is one of the north central and coaster states of Venezuela and its Capital is the city of Maracay. 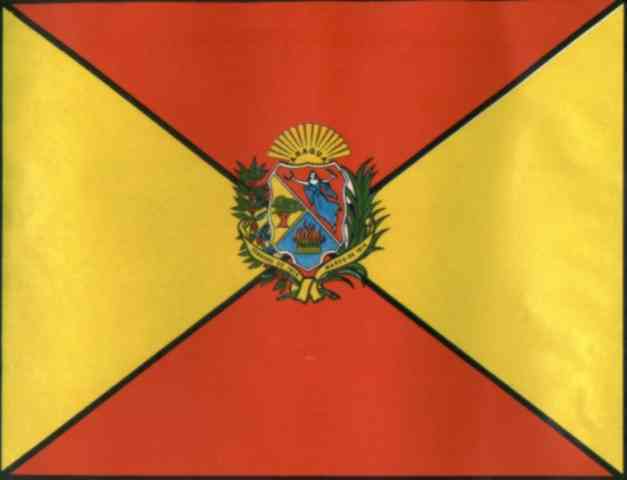 In the course of the year 1991 and by instances of Mr. Carlos Tablante Hidalgo, Governor of the State, was given beginning to the diligences for the creation of a regional flag and for that purpose was requested the collaboration of the Professor Oldman Botello, Chronicler of the City of Maracay and of Villa de Cura, another of its important populations, who suggested a flag in which prevails the colors Yellow and Red taking as premise for that the semiology before mentioned with base in its heraldic connotation. On January 16th, 1992 and for disposition of the Regional Executive, a concourse was promoted to determine the design of the new flag to the one that some three hundred people converged, many of them students. After considering the presented designs, the qualifier jury integrated by the Professor Botello, the Professor Luisa Teresa Lanz de León, Secretary of Education and Social Assistance of the Aragua State and the Professor Enrique Salas Dugarte, President of the Bolivarian Society of the State, selected on 17 February 1992, a project presented by the Licentiate Inés María Valverde Pérez that once remitted to the Legislative Assembly, it was approved following 20 October when was proclaimed the Law of the Flag of the Aragua State. Sources: Symbols of the State Aragua, Prof. Oldman Botello. The Coat of Arms: The Araguenian Coat of Arms consists in a field divided per bend and half counterbend. The first quarter in gules (red) shows a blond woman dressed and winged of silver which subject a laurel crown with her right hand and a palm branch with her left hand: representation of the ancient greek goddess of the Victory which allude to the battle which got rid in the town with the same name, La Victoria (The Victory) on 12 February 1814, where young students and seminarians of the University of Caracas fought jointly with the Patriot Troops under the command of General José Félix Ribas, one of the most valiant heroes of the Venezuelan Independence War, and won over the royalist army under the conduction of the Spanish Colonel Francisco Tomás Morales. The second quarter in gold (yellow) shows a representation of the so-called Samán de Gu:ere: historical tree admired by the famous German Naturalist Baron Alexander von Humboldt and his friend, the French Botanic Aimee Bonpland. In their visit to Venezuela on 1800, they calculated that the plant then was about 1.000 years old. Time after, El Libertador Simon Bolívar, it says, rested under its frond when he was on campaign and from these times until now, it constitutes ecological emblem of the State, representing too the inexhaustible fertility of the Araguenian ground. The third quarter in azure (blue) presents a semblance of the Historical House called El Ingenio Bolívar (The Bolivar's Sugar Cane Farm and Mill) located in the town of San Mateo and property of El Libertador's family which was conditioned as Patriots' bastion during the War of the Independence: place where surrendered heroically his life the New Grenadine (Colombian) Colonel Antonio Ricaurte firing the Gun Powder deposits when the royalist troops took the house on 25 March 1814. As timmer, a nascent sun appears with the name of the state ARAGUA like a war voice. To the flanks, we can see a coffee and a sugar cane branches, two of the most important agricultural products of the region, jointed by means of a golden pennant which charges like mottoes the ephemeris February of 1814 and March of 1814 to remember the glorious facts of The Victoria and San Mateo, previously mentioned. This Araguenian symbol, whose origin was that of Seal of the State starting from the eighth decade of the XIX century, it was decreed as Coat of Arms in 1905 and ratified as such in 1926. Sources: The Sacred Symbols of the Venezuelan Nation, Francisco Alejandro Vargas, 1981.